"The only repetitive head trauma Joseph Chernach had was from playing football." 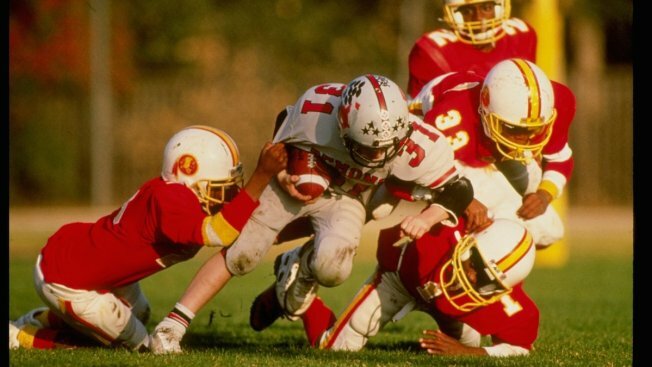 In this file photo, a general view of the action during the Pop Warner Football Championship is seen on January 1, 1991. A Wisconsin woman sued the Pop Warner organization Thursday over the suicide of her son, which she claimed was due to dementia caused by brain injuries he suffered playing tackle football beginning at age 11. The mother of a Wisconsin man who died in 2012 sued the Pop Warner organization Thursday, saying his suicide was the result of dementia and deep despair caused by brain injuries he suffered while playing youth football. Joseph Chernach was 25 when he hanged himself in his mother's shed in Hixton, Wisconsin, in 2012. The lawsuit filed in federal court in Madison, Wisconsin, says he suffered from a degenerative brain disease called dementia pugilistica, also known as chronic traumatic encephalopathy or CTE, and that he also had post-concussion syndrome. And it alleges he got them from playing in a Pop Warner league from 1997-2000, beginning when he was 11. The wrongful death lawsuit by Debra Pyka seeks at least $5 million from Langhorne, Pennsylvania-based Pop Warner Little Scholars, the Pop Warner Foundation and their insurance company. It says Pop Warner never warned Chernach, other children or parents about the risks of playing tackle football. It alleges Pop Warner Football is an "ultrahazardous activity" that's intrinsically dangerous to children. "Pop Warner — by engaging in the business of sponsoring, organizing and promoting tackle football for children — engaged in conduct that was outrageous, malicious, intentional and was done with the intentional disregard of Joseph Chernach's rights as well as all other children who played Pop Warner football, not just in the State of Wisconsin but everywhere in the United States," the complaint charges. A Pop Warner spokesman did not immediately return a call from The Associated Press seeking comment Thursday night. According to the lawsuit, Chernach got good grades in his freshman year at Central Michigan University. But it alleges the cumulative effects of CTE and post-concussion syndrome began to impair him in his sophomore year. "From that point on his behavior became increasingly bizarre," the complaint says. "From that point on his mood became progressively depressed and ultimately paranoid, distrusting his closes friends and family. ... Joseph Chernach's suicide was the 'natural and probable consequence' of the brain damage he suffered playing football." Pyka told the AP her son eventually stopped going to class. "The depression got worse as time went on," she said. "The last year was awful. He was in his room a lot. He lived back and forth with his brother and some of his friends. He would come to my house. He just could not stay in any place at once. He tried to hold down a job but it was difficult for him. He would sleep all day and then be up at night." His family didn't learn of his brain damage until they received the autopsy results. Pyka's lawyer, Gordon Johnson, of Sheboygan, Wisconsin, told the AP it showed that Chernach was halfway toward the worst form of dementia seen in older football players. "There really is only one thing that could cause CTE in a young person as this and that is repetitive head trauma," he said. "The only repetitive head trauma Joseph Chernach had was from playing football." The attorney acknowledged that Chernach also played high school football, but said he was most vulnerable playing youth football. Johnson said it's the first of what may be many cases against Pop Warner for exposing children to the kinds of risks that even the NFL is concerned about for its players. He said they think there have been hundreds of other suicides in which autopsies, had they been done, would have pointed the finger at youth football. "I think that somebody should be held accountable for Joseph's death," Pyka said. "I want to see tackle football stop for these young kids. ... They should not be banging their brains together."